5. Green Goblin. I get that Disney Infinity is deeply tied into the larger Disney marketing machine, and that the movies and TV shows it pulls its characters from are mostly based on the Ultimate comics. That doesn't excuse this misstep. The Green Goblin is the worst figure in the entire Marvel line so far, barely recognizable as a character both in its design and in how it plays in the game. Yes, that blue ball he's holding is supposed to be a pumpkin bomb. Supposedly he'll have a glider at some point, but currently this Goblin doesn't tool around the only way the Green Goblin ever has. This is the downside of synergy. 4. The Falcon. The rest of the new Marvel figures are all pretty great. The Falcon might be a half-step below the rest because he doesn't have his faithful sidekick Redwing, which would be great in a game but (of course) reflects the bird's absence outside the comics. Falcon has a great, dynamic pose, though, and his power set both suits the character and expands nicely throughout his skill tree. 3. Ronan the Accuser. I miss the classic Jack Kirby design of Ronan's outfit, but he still cuts an imposing figure in his austere armor and massive hammer. 2. Yondu. Sure, this Yondu could barely be more different from the guy in the comics, but the Michael Rooker-ized version from the movie is an improvement on the questionable old "noble savage" schtick. It also stands out as a Disney Infinity figure--instead of striking some goofy superhero pose, Yondu stands poised and alert, barely giving away his tension. It perfectly fits the cagey mercenary of the Guardians film. 1. Loki. Loki's not just the biggest character to launch in this wave--he's the best designed figure, too. The regal garb has a lot to do with that--the sweep of his cape curls straight up into the tips of his helmet's horns, a single, delicate line representing the character's slipperiness. His powers in-game are built around confusion, making him a slightly more strategic fighter than most of the characters in the game. 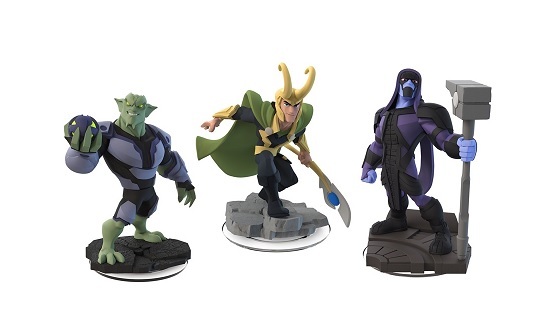 If you can’t get enough tiny little toys for your Disney Infinity game, good news: more Marvel figurines came out last week. Let’s take a quick look at the two new figures from March, Loki and the Falcon, as well as the three that came out in January. We’re ranking them based on how they look and also how the characters play in-game. We did this earlier with the Disney Originals figures, and will be doing it again with whatever waves come out in the future. It’s a thing we do.